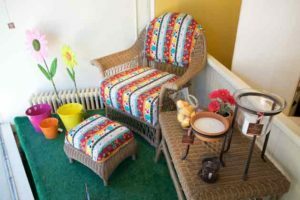 Owner Mary Batson opened in 2008, and as a 20-year resident, she knew the best location and type of merchandise for her clientele. “I’ve always loved coming down here to meet friends, and I’ve shopped here for years,” she says. Though packed with an array of merchandise, the store is open and inviting. Items are displayed on antique pieces like library tables, sideboards and benches, and in repurposed pantries and chiffarobes. Shoppers come here to find special, one-of-a-kind gifts, whether for a birthday, anniversary or baby shower. There are purses, scarves, hats and jewelry; picture frames, paintings, candles and figurines; pens, desktop items, clocks and watches. Teens and kids can find the latest in hot trends, from zany bands to Japanese erasers. No need to only shop. The coffee is always fresh, and comfy chairs beckon those waiting for a shopper or who have themselves been shopped out. With her distinctive, gabled Out of the Box box, Batson’s free gift-wrapping puts a bright bow on the experience. Sandie Schwarz is making a living doing what she loves. A longtime quilter, she had been out of work for a year when she noticed this shop was going out of business. She stopped and asked the owner to let her take over instead. That was in 2005. 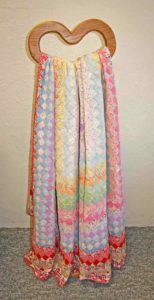 Her personal preference is the 19th century, but she also carries fabrics and patterns from the 1930s and ’40s. Find picotage, ditsie, and basketweave, along with hand-dyed, felted wool. Brands include Thimbleberries and Quilting Treasures fabrics, and Karen Whit and Renee Plains vintage patterns. Schwarz hosts quilting classes in the evenings, including Block-of-the-Month Club. A staple in this college town since 1984, this is the spot to come for the retro, vintage and cutting-edge. Originally selling just vintage clothing, the store has evolved to include an eclectic mix of wearables, jewelry, hats, bags and purses, along with gifts, home décor, bath and body products and even furniture. You’ll find eco-friendly soy candles bath essentials next to incense, oils and gemstones. Unique gift cards, stationary and books reflect owner Lauren Woods’ personal taste, as do the soaps, lip balms and hand creams. Lampshades drip with glinting crystals or shimmer with fringe trim. 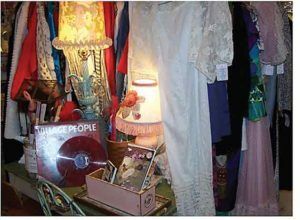 Old clocks and clock faces, antique and shabby-chic furniture, vinyl records, knick-knacks, art and posters create a special ambiance that’s part antique mart, part flea market, part urban retail. As shoppers enter this book nook, they’re met with the aroma of coffee, pastry and ink, prompting a deep breath and relaxing sigh. “We have all the necessary things in life – books, coffee and snacks,” asserts co-owner Gloria Theofanice. She and her sister, Herminda Spencer, opened five years ago this October, after running a cafe together in Schaumburg for seven years. The store looks small at first, but the shelves continue into three more rooms. 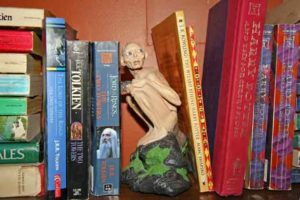 The sisters specialize in used and rare tomes, but there are books for every type of reader, from the classics to contemporary. “Shakespeare is our most popular, and we’ve been going through copies of Animal Farm and Catcher in the Rye,” says Theofanice. Find current authors like Patterson, Binche and Roberts, along with self-help, special interest, children’s, history – all categorized, grouped and labeled. Morning regulars come in for the fresh Columbian coffee, espresso or specialty teas and pastry as they discuss books and current events. The walls are covered with black-and-white photos and paintings; the shelves hold not only books, but fun figurines, bric-a-brac and bookends. Some are for sale; others are not. This entry was posted on Monday, January 24th, 2011 at 1:50 pm	and is filed under Nooks & Crannies. You can follow any responses to this entry through the RSS 2.0 feed. Both comments and pings are currently closed.